Fans of the duplicate hero genre will not be surprised by the plot developments in Mohan Krishna Indraganti’s Gentleman, but it is an enjoyable film with some very good performances. Unfortunately the trailer doesn’t do the film justice. But here it is. Aiswarya and Catherine meet on an international flight heading back to Hyderabad. In a stilted “hey I know how we can fill in the time” scene, the ladies decide to tell each other about the men in their lives. Cathy tells her self-described cinematic story of meeting Gowtham, and falling head over heels. Now, Gowtham is the typical filmi hero stalkerish won’t take no for an answer guy, but Catherine sends him encouraging signals. Their dates are actually very cute, they have fun together, and they do seem to genuinely like each other. She had to leave him to go do a VFX course in the UK, and can’t wait to see him again. Aiswarya tells Cathy about her perfect fiancé Jai. Where Catherine and Gowtham were endearingly real, Jai and Aiswarya are annoying, privileged and clueless. They can get in the sea. They go on a roadtrip for two days, and ostentatiously leave all their money in their checked baggage. Aiswarya makes up rules about not working or trading things for money and not calling home. This is to test them and their compatibility. So they whinge the whole way to their destination, except for a brief break for Rajnikanth impressions, and take advantage of the hospitality of poorer locals. In one of many brilliant decisions, Jai feeds Aiswarya magic mushrooms then freaks out when the hallucinogens kick in. Finally they decide they must be each other’s soulmates because really, who else could stand either of them? Imagine Catherine’s surprise when she sees her new bestie walk up to Gowtham’s double at the airport. And imagine her shock when she goes to Gowtham’s home only to be told he was killed in an accident. Was there a connection between Gowtham and Jai? Was Gowtham’s death really an accident? What does her friend Aishu really know about the man she is going to marry? And now imagine the rest of the story! Or, just wait until the end when two characters do an awesomely committed bit of “As you know Bob” exposition and explain the entire plot for the convenience of an eavesdropping character and anyone in the audience who hasn’t worked it out. 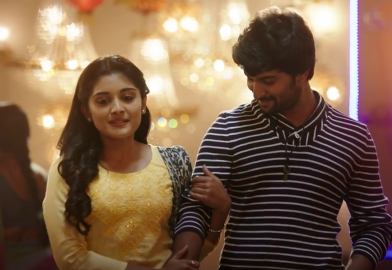 Niveda Thomas is fantastic as Catherine. Her acting is quite natural, and she has a healthy realistic beauty. Her chemistry with Nani was great, whether he was playing her boyfriend or the suspiciously perfect man going to marry her rich friend. When she started to question Jai’s integrity she took action herself and was as rational as someone so invested in the outcome could be. I also have to give some credit to whoever styled her for choosing a wardrobe that a normal young woman would wear instead of having her teeter around in high heels and higher skirts. Niveda has screen presence beyond what I’d expect for a 21 year old woman in an industry not known for developing actresses beyond their cup size. Surabhi was less impressive as Aiswarya, but that was likely due to the limitations of the character. Aishu was ignorant of the suspicions about her fiancé so was mostly the bubbly happy bride to be. She certainly looked the part of a pampered girl with an optimistic nature, and her scenes with Nani were generally good (if nauseating). Nani’s characters developed from different directions. Gowtham was a bit of a pest who revealed his heart of gold as Cathy got to know him, while Jai started sweet and considerate, then revealed more of his ruthless side. Nani is always likeable, but he managed to make Jai creepily perfect so that everything he did after a certain point became suspicious, regardless of how innocuous it was. Even his 70s cop show blow wave seemed to indicate menace. Gowtham seemed less calculating, more of a take it as it comes kind of guy, and a bit glib. 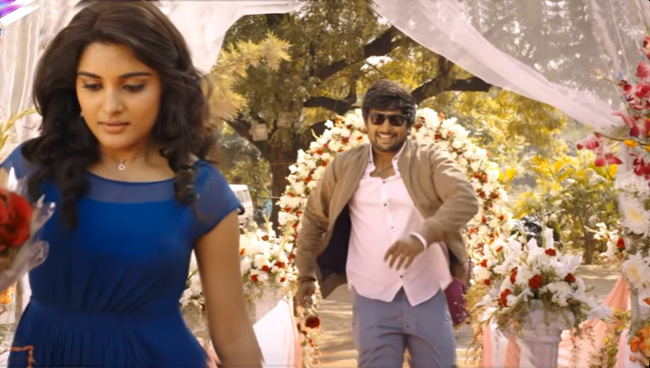 Gowtham’s fight scenes were very tongue in cheek and entertaining, which suits Nani to a T.
Sreemukhi is Nitya, a straight talking journalist who takes an interest in Jai’s business dealings and seeks Catherine out to help confirm her suspicions. They had a nice dynamic and it was good seeing another sane career woman in the ensemble. Srinivas Avasarala is good as Vamsi, Jai’s suspiciously agreeable cousin who doesn’t seem to mind being ignored continuously in favour of the golden boy. Vennela Kishore was amusing as highly strung work supervisor and Youtube legend. Tanikella Bharani has a small role as Jai’s uncle Mohan. It’s a blink and you’ll miss it gig so maybe he was just doing a favour for a mate. Vinay Varma is Catherine’s creepy uncle David, and I shed no tears for his character. This film was very smart in how it showed their relationship and Catherine’s reaction without getting into voyeuristic rapeyness. It was all wrong, and no more needed to be said. Rohini played Gowtham’s mum, and every time I see her on screen I just love her. Her acting is excellent, and she and Nani still had the rapport that I loved so much in Ala Modalaindi. Saturday Night Fever had a dorky fun feel, with the main cast doing enthusiastically uncoordinated dancing that helped gloss over the song’s lack of freshness. Mani Sharma’s songs are standard formulaic film fare, and most add little either visually or musically. The engagement song at Aiswarya’s house (Dintaka Dintaka) was nice mostly for seeing the character actors get their moment in the spotlight. I liked the use of graphic novel style effects in some early scenes but that seemed to go by the wayside later on in favour of standard dodgy looking breaking glass VFX and the like. Odd considering Catherine’s career, they didn’t seem to invest in getting that right. While I was overjoyed to have subtitles, there were some silly errors in them. Broachers for brochures, one excellent instance of comma for coma, and my favourite – missionary for masonry (as in, the reinforcing rod is embedded in the missionary masonry). It did deflate a very tense scene. 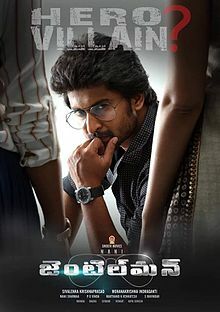 See this for a complex and yet fast moving plot carried by Nani’s rock solid skills, and Niveda Thomas’ excellent heroine who does stuff that won’t make you facepalm all through the film.